The Ascend line of mycorrhizal inoculants are designed to increase a plant’s ability to utilize available nutrients and moisture in the soil. These products contain naturally occurring endomycorrhizal fungal spores that germinate and penetrate a plant’s roots. 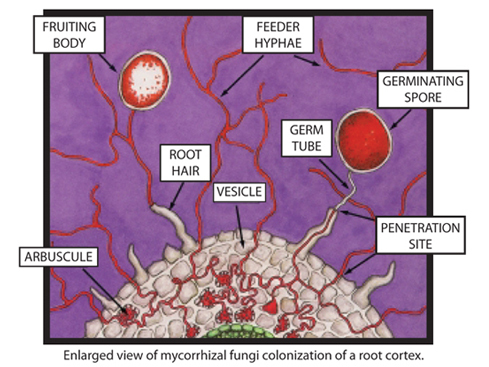 The mycorrhizal fungi send out additional hyphae that act as a secondary root system. These microscopic hyphae search out additional moisture and nutrients that a plant cannot find with its normal root system. This symbiotic relationship increases plant growth to create a plant that is more resistant to stress. Mycorrhizal fungi occur naturally in many soils, but their presence is often lacking where they are needed most. This includes sterile growing media, fumigated or pasteurized soil, cut and fill leveling, and flooded or fallow areas. The use of Ascend products put mycorrhizal fungi into areas where it is absent or has been destroyed. This increases the inoculated plant’s ability to survive and prosper in these induced stress conditions. The root mass of the plant will increase in size and longevity. The additional hyphae from the mycorrhizal fungi can increase the root surface area by 10 to 1,000 times. This gives your plants up to 1,000 more opportunities to find additional water and nutrients in the soil. Owners and operators of farms, ornamental nurseries, golf courses, agricultural production nurseries, land and tree care operations, municipal parks, and greenhouse operations are already discovering the economic and production advantages of using Ascend products. Increasing a plant’s ability to absorb more nutrients can lead to many advantages for your operation. Ascend DC (dry concentrate) is a dry powder best suited for nurseries and small farm use. The dry powder should be kept cool and out of direct sunlight until use. Ascend PA (production agriculture) is a two-part kit comprised of a dry powder and a liquid carrier that accelerates the spore germination. The dry powder is added to the liquid carrier just prior to field application to extend the shelf life of the product and to ensure the spore containing powder is in suspension for best application through drip systems and to provide an even application rate. The dry powder should be kept cool and out of direct sunlight until use. Ascend ST (seed treatment) contains endomycorrhizal spores in a special dry powder carrier designed to provide improved adherence to seeds so that the spores stay near the emerging roots and have an increased likelihood of germinating and attaching to the young roots. The dry powder should be kept cool and out of direct sunlight until use.